Contrary to conventional wisdom, the underlying reason for Israel’s high rates of poverty and inequality and low rates of economic growth over the past several decades is not due to insufficient government budgets but to the underlying national priorities that determined how those budgets were allocated and spent. Why are Israel’s rates of poverty and disparity so high and what caused them to rise over the past several decades? How did it happen that, despite population groups within Israel that innovate at the frontiers of human knowledge, the country’s steady state rates of productivity and economic growth consistently lag behind those of the G7 countries leading the Western world? Has Israel’s defense budget been so large that civilian public expenditures were simply insufficient for coping over the years with the country’s primary social and economic problems in the realms of education, employment, health and welfare? The chapter on public expenditures in the Taub Center’s recent State of the Nation: Society, Economy and Policy 2009 report focuses on these questions. Some of the highlights from this chapter are brought forth here. In seven of the eleven years between the 1973 Yom Kippur War and the peak inflation rate of 445 percent in 1984, Israel’s public expenditure exceeded 70 percent of the country’s Gross Domestic Product (GDP). After implementation of the Economic Stabilization Program, the country’s public expenditure fell to an average of 53.4 percent during the two decades spanning the years 1985-2004, which is still relatively high compared to other Western countries. The prevailing conventional wisdom in Israel has been that although total expenditures are higher in Israel, the civilian portion of public expenditures is lower than the Western average because of the much higher defense expenditures in Israel. Figure 1 compares Israel’s public spending to that of the OECD countries. The average Israeli expenditure of 53.4 percent of GDP over the years 1985-2004 was indeed higher than the OECD’s 41.3 percent of GDP during that same time period. Also, Israel’s average defense spending, 10.4 percent, was substantially higher than the OECD’s 2.8 percent. However, after subtracting defense spending from overall expenditures in both Israel and the OECD, Israel’s civilian expenditure (43.0 percent of GDP) was still 4.6 GDP percentage points higher than the OECD’s (38.4 percent of GDP). To illustrate how much Israel’s civilian expenditure exceeded the OECD’s over these two decades, it is possible to estimate the cumulative value of Israel’s surplus civilian expenditure compared to that of the OECD by multiplying Israel’s output by the difference between civilian expenditure in Israel and in the OECD during each of the years. When tallied up, Israel’s surplus civilian expenditure relative to the OECD average for the 1985-2004 period equaled NIS 363.9 billion in 2008 prices. This amount is half of Israel’s entire 2008 GDP of NIS 725.1 billion. In other words, Israel’s long-run trends of low growth and high poverty and income inequality relative to the OECD in recent decades did not result from lower civilian expenditures than the OECD, but from different priorities in the utilization of the civilian budgets. The high level of public expenditures, which were not completely funded by taxes and other revenues, resulted in annual budget deficits. The financing of these deficits has meant that Israel had to borrow and subsequently return not only the principal on the loans, but has also had to pay the interest on them. Interest payments represent a “fine” of sorts that is placed on Israel’s inability or reluctance to live within its means. Debt is justified when the loan is used for building infrastructure that would also benefit the next generation – which makes it reasonable to expect that the next generation should also participate in paying for it. But when it comes to infrastructure projects over this period, Israel lagged far behind the OECD countries. For instance, in the area of transportation infrastructure, traffic congestion in Israel reached three times the OECD average, though the country only had half the number of vehicles per capita as the OECD (Ben-David, 2003a). The act of borrowing to pay for expenditures that do not pertain to infrastructure investments means rolling over to the next generation bills for expenditures that the future generation will not benefit from. The fact that Israel’s annual interest payments as a share of GDP are more than twice the OECD average is a serious enough problem. When this is combined with the fact that Israel’s physical infrastructure has been seriously neglected over these two decades, the problem becomes even more acute. Israel’s interest payments reached NIS 33.3 billion in 2008 (Figure 2), more than the Education Ministry’s overall budget that year, which reached NIS 28.6 billion. In fact, interest payments – the “fine” Israel paid in 2008 for its inability to live within its financial means – were more than double the budget of all the elementary and secondary education in Israel and nearly double the Health Ministry’s entire budget. This is one practical implication of rolling the debt over to the next generation. However, even after subtracting from public expenditure not only the defense spending but also interest payments, Israel’s civilian public expenditure over the two decades (35.6 percent of GDP) was almost identical to that of the OECD (35.4 percent of GDP). 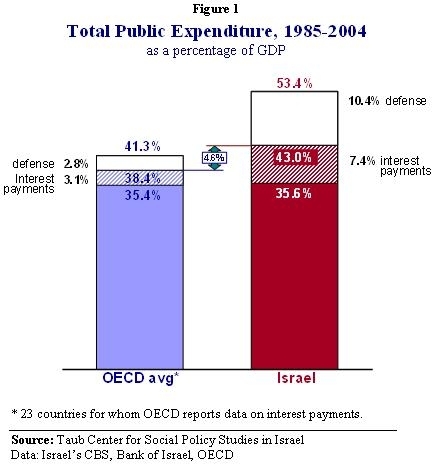 This relative equality in civilian spending between Israel and the OECD seriously undermines the prevailing conventional wisdom that Israel’s civilian expenditure was too low to allow an in-depth treatment that might have alleviated the country’s high (in comparison to the OECD) rates of poverty and income inequality and relatively low rates of economic growth. It is interesting to compare Israel’s public expenditure not only to other countries but also to other time periods in its own history. Figure 3 presents a comparison of recent years with the past, while continuing to exclude defense spending and interest payments. In the 1960s, during the years preceding the Six Day War and in the shadow of existential national security threats, Israel absorbed massive waves of immigration, built roads, towns, schools and research universities – projects that we know today as key infrastructures for generating economic growth. During this period, Israel was characterized by substantially higher economic growth than all other countries with similar income levels while income disparities within Israel were very low compared to most Western countries. The infrastructure investments in the 1960s were made when Israel’s civilian expenditures (excluding defense and interest expenses) were 20.6 percent of GDP, slightly more than half the country’s average public expenditures over the years 1985-2004 (also excluding defense and interest expenses). Israel’s public expenditures, excluding defense spending and interest expenses, grew considerably between the Six Day War and the Yom Kippur War. The ratio of expenditures to GDP rose by almost one half, from 20.6 percent of GDP before the Six Day War to 29.5 percent of GDP in the years 1968-1972. After the Yom Kippur War in 1973 and until the record inflation year in 1984 and the Economic Stabilization Program, public expenditures (net of defense and interest payments), rose by an additional 10 percent of GDP, reaching 39.9 percent of GDP in the years 1973-1984. The substantial increase in civilian public expenditures reflected a major change in Israel’s national priorities. Although the overall total was higher than it had been in the past, the era of large investments in basic infrastructures for the development of a modern economy came to an end, making way for new priorities that reflected much less of a national perspective and considerably more sectoral, local and/or personal considerations. Consequently, the rate of economic growth declined significantly. In recent years, including the budget years 2009 and 2010, Israel’s public expenditures, after exclusion of defense and interest expenditures, have been lower than the OECD average. This reduced level of available funds requires that the money be spent wisely. It also requires a serious examination of how the burden of its financing is distributed among Israel’s population together with a substantial improvement in the enforcement of the country’s tax laws. In a world that is witnessing increased competition between countries, when Israel’s rates of poverty and income inequality are high and its long run economic growth path is lower and flatter than those of leading Western countries, national priorities in budget allocation play a crucial role. The time has come for dealing with the question of whether the government budget should focus primarily on providing core treatment of central social and economic issues from a national perspective – such as building and strengthening human and physical infrastructures – or whether the focus should be on sectoral, local and/or personal interests. In a country that already has to bear a substantially heavier defense burden than is typical in the West, there is an even greater need for responsibility and caution when deciding how to spend what remains of the budget. Expenditures should be determined on the basis of national interests, with an emphasis on providing the tools and conditions that will enable as many people as possible to successfully contend in a modern economy while stressing a more selective social security network that maximizes the available assistance to those who truly need it most.